Showing 1 - 2 of 2 Products for Turbocharger Cartridge. When turbochargers fail, the common response is the replacement of the entire unit. However, the damage is often isolated within the turbo cartridge, which contains the core components of the turbo assembly. By replacing just the cartridge, the remaining components can be salvaged and repair times reduced. 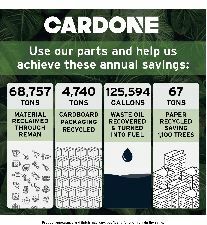 CARDONE cartridges are assembled with O.E.-grade components to ensure high performance and durability.